Licorice (Glycyrrhiza glabra) is the plant which provides the well-known sweet roots, who are chewed or employed in all sorts of desserts, sometimes replacing sugar completely. The plants are surprisingly easy to grow, but they don’t stand a heavy wet soil, they just rot away in these conditions (I’ve had the experience twice, now I’m growing it in a sandy spot, and it works fine). Give licorice lots of sun and warmth, and plants will grow quickly to a height of over 1 metre, I’ve had some flowers in 2003, these obviously need a very warm summer. Licorice is quite easily grown from seeds, as far as I remember, the seeds are best sown fresh. Give lovage a fertile soil, a sunny spot, moisture retaining and you can get a huge plant (I’ve had them up to 2 metres and more). Lovage (Levisticum officinale) is a sort of ‘herb replacement’ for cellery, although that’s a bit too simple. The taste is definitely stronger compared to cellery. The leaves and (especially young) stems are used, and the young shoots can be blanched to give them a somewhat sweeter taste. This one is giving me a hard time, the fruits are one of the most delicious I ever ate, and yet my plants stay unproductive. I tried spineless and spiny varieties, but no success, hand-pollination didn’t work...And yet, it can be done in Belgium...I saw some fruit at a friend’s place and in the botanical garden in Meise. Lulo (solanum quitoense) is a plant that loves lots of moisture and temperatures ranging from 20-25°C, they don’t like to spend the summer in a warm greenhouse. The plants also prefer a semi-shady spot, and lots of moisture. They are perennial, I once had a plant that lived for six years, surviving indoors and placing it outside during summer. This one has so many different names that I placed it under the Latin name: tarwi, chocho, Andean lupin, ... They have a similar growing habit as ornamental lupins, and the seeds are eaten, but be careful: they have to be soaked in water, at least for two days, and the water has to be thrown away, these seeds contain alkaloids, which are poisonous. They are mainly grown for their protein content, which is extremely high. In South America, whole fields of lupinus mutabilis can be found, and hundreds of varieties. There’s another edible lupinus that’s edible, lupinus albus saccharatus, easy to grow, just like ornamental lupins. Seeds have a lower contenance of alkaloids, but are still best soaked for a day or more. 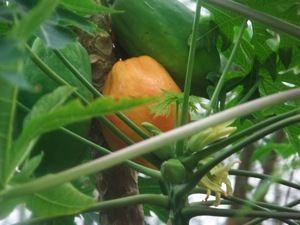 One of the many edibles from the solanacea family (beware: some very poisonous plants are also member of this family), litchi tomato (Solanum sisymbriifolium) is grown for the edible red berries. The berries taste nice, although they could do with some further selections, for a sweeter taste and lesser presence of seeds in the fruits. The plants are very spiny, and grow quite big, over 2 metres isn’t exceptional. I even had good luck with them in a semi-shaded position in a bad summer. And, again a sort of beware: these plants are a noxious weed in some part of the US (mostly the southern States), they can reseed very easily!